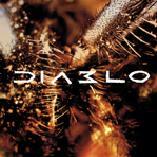 Diablo’s fourth record was one of the biggest teases of my metal year 2006. After the marvellous Eternium, even a years worth of waiting became a bit daunting. The release took place months ago and one of the reasons it took me so long to review this disc is that at first, I was not impressed. The D-boys have not gone soft in any way, the material is still punishing and heavy. Neither have any monstrous changes in the bands direction taken place. The mixture of Pantera/Machine Head-style grooving aggro metal and new school thrash metal, blended with doses of death metal and hefty melodies is very present and potent. The song material just didn’t strike me down like on Renaissance or Eternium. After months of repeated playing the claws of Mimic 47 began to sharpen and I was not so harsh on the record anymore. So let ‘s delve through in detail. The beginner, Shadow World, is weak. This could be one of the reasons I was dumbfounded upon the first listens. The band plays tightly, singer/guitarist Nygårds rough voice is in brilliant form and the production is stellar, all the way to the brilliantly pummelling bass, which is very audible. But the song goes nowhere. The opening riff feels like something out of the nu metal 101-playbook (a factor that I don’t consider a disaster as a default, but right here I do). The lead melodies are a big improvement and the verses with the ghost-like clean picking work well, but the song goes nowhere. The mid-tempo pummelling of Damien is much more enjoyable with the fist-pumping groove and a very catchy chorus. The occasional female vocals serve as excellent hooks. Together As Lost dives into mediocrity again despite the well-made solo while In Sorrow We Trust picks up the slack with a slow, steamrolling vibe that feels perfect for live stage surroundings. I began to see a pattern here after four tunes – miss, hit, miss, hit. It repeated yet again as the title track, that was also released as the first single, tries to give a beating with the random double-bass and tortured screaming, but ends up proverbially chopping the tree down with a herring (Monty Python, anyone?). Then we have the first absolute killer, Condition Red, which coincidentally is the first really fast one. Blazing riffs combined with catchy leads and a brilliant shout-along chorus make for one crushing track. Kalla is a short instrumental that would do a lot more for me if it connected as a kind of an intro to the following song, but like this it just feels detached and bit pointless. Blackheart possesses a moshing groove that gets thumbs up from me, while Kathryn again just whips out the herring and keeps on slapping. Nice solo there again, though. The album is closed with the excellent duo of Rebellion Of One and D.O.A. Especially the old school letter-shouting and haunting bridge-section of the latter brings a smile on my face. Overall, Mimic 47 does not convince me as much as I would want it to. It is very good record, but the song material just isn’t up to par with the bands earlier work. I think there is too much mid-tempo here and not enough clear variation between songs. The abundant melodies and solos have increased when compared to the previous albums, which I enjoy a lot, but this wasn’t enough to bring the album to an outstanding level. When talking about metal from the new millennium, I would definitely recommend Diablo to everyone, but Renaissance and Eternium are superior choices to begin with.